We have our DOL testing endorsement! WRITTEN (KNOWLEDGE) TEST - $34.95 FOR THREE ATTEMPTS FOR THE SAME PERSON. Available in 7 languages. 911 Driving School. Experience. Knowledge. Trust. Simply the best. Drivers’ Education taught by Police Officers! 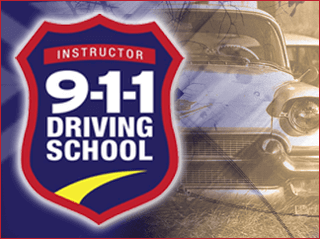 Our instructors, with their extensive law enforcement backgrounds, work to make this defensive driving school in Seattle the place where you can confidently acquire the necessary skills to become a better driver. Our instructors have a vast amount of knowledge and experience, and they have hundreds of real-life stories to share, making this drivers’ ed program uniquely effective. We are a small office and we get hundreds of phone calls per day. The best way to get a hold of us is by email. To make your check in more efficient, please register with the DOL and with us on our website Before coming in. Our knowledge tests are walk ins once you are registered with us. We do not schedule them. Please see our knowledge test schedule below. Spanish Speaker Available At This Location!!! WALK IN TESTING AVAILABLE EVERYDAY!!! Online registration and payment is now available for teen and adult lessons, including both knowledge and road tests. No car to take your test? No problem. Use ours for an additional fee. 6 Hours Behind-the-Wheel Driving Lessons scheduled outside of classroom time. You can choose the times and dates that best meet your schedule via our 24 hour web scheduling system. Drives are done 1 hour at a time. A minimum of 3 drives must be completed by the last scheduled day of class. Pre-Register for your WA State Knowledge test and walk-in for any posted testing time. Times are shown higher up on the main section of this web page, or please call anytime for availability. The price is good for three attempts for the same person. Only three attempts allowed per day on days with multiple test times. Please sign up here first, then call to verify testing times and dates. We have Nissan Versas, Chevy Sonics and Ford Taurus. You do not need your own insurance to use our cars. The WA State knowledge test must be passed before a Road Test can be provided. We can provide you with a temporary permit to take the test if you do not have a WA permit or license from another country. Pre-Register for your WA State Knowledge test and walk-in for any posted testing time. Times are shown higher up on the main section of this web page, or please call anytime for availability. The price is good for three attempts for the same person. Only three attempts will be allowed per day on days with multiple test times. We have Nissan Versas, Chevy Sonics and Ford Taurus. You do not need your own insurance to use our cars. You must have a license from another country or a WA permit to do the warm up. We cannot provide a temporary permit for warm ups. The warm up is intended for those who already know how to drive and are familiar with the rules of the road, but just want some time to relax and get comfortable. Testers will answer questions and practice any skills the customer wishes to work on during the warm up period. The same person who does the warm up will also administer the test itself. We schedule one hour total. The WA State knowledge test must be passed before a Road Test can be provided.